So you’ve got your qualifications and experience, it’s now time to set yourself up in business. We’ve put together this resource to guide you through the process of becoming self employed. Find out the benefits of being a sole trader or a limited company, and the downsides to each of them. Maximise on your skills and choose the right path for you to become your own boss! New figures show a rising number of people turning to self employment. Due to the last recession, a generation of entrepreneurs has emerged and they are choosing to set up their own businesses. The number of those in self employment has risen rapidly in the past five years from 1.5 million to now more than 4.6 million. That’s the equivalent to one in seven of the UK workforce that has chosen self employment. Self employed people have many responsibilities when working for themselves, including: finding their own work, managing their own business accounts and paying taxes on time. However, in return, you will also become your own boss and get the opportunity to create your own career path, without relying on anyone else. There is a distinct entrepreneurial spirit with those working for themselves. Although you may think of self employed workers as young individuals who are breaking away from the city life and carving their own career paths, the average age of a self employed worker is actually 47. Surprisingly, 43% of self employed workers are aged 50 or over, proving that there really is no age limit on starting your own business. The reason for a rising number of over 50’s choosing self employment could be due to the difficulty of changing jobs at a later age, unexpected redundancy or staying productive with a business after retirement. Over the past five years, the number of self employed over 65 year old’s has risen to half a million and shows no sign of slowing down. Technology has been influential in driving up self employment numbers. A staggering 70% of all new businesses start off at home, all of which would not be impossible without new technology devices which enable you to work from anywhere. Currently more than half of all businesses are home based, which is a benefit to self employed workers as it drives down building rental costs and further bills. London is home to the most self employed people, with 17.3% of all self employed residing in the capital, followed by the south west with 16.6%. However, further north you are less likely to be self employed, with a small 11.5% living in Scotland and 10.8% in the North East. The most common self employment roles tend to be taxi driving and working in construction, due to the constant demand. Across the UK, there are also many opportunities for self employment in environmental and land based industries. Those working in the trade industry are more likely to be self employed and working for themselves, due to the nature of work. The top three self employed trades in the UK are carpenters, electricians and builders! Although self employment may seem like a lonely career option, if you work in the trade industry, you will find that it’s the opposite. Every day you will be engaging with customers and suppliers, building work relationships, and not cooped up in an office or at home. There is a constant high demand for skilled tradespeople, with 1 million currently working across the UK. This gap in the market offers huge potential for growth, with opportunities constantly appearing. When choosing to become self employed, you have two main options for your business: become a sole trader, which is considered to be the simplest and cheapest of ways to start a business, or become a limited company, which gives your business a unique and separate identity but involves more administrative work to set up. As of 2018, there are more than 3.4 million sole traders in the UK, which account for 59% of all businesses. It is by far the most popular option for the self employed, being easy to set up and maintain. With sole traders, there is one individual who solely owns and runs the business 100%. As a sole trader your business lacks the protection that a limited company has. If your business goes into to debt or a claim is made against your company, you are personally liable for this debt and risk bankruptcy, if the debt is considerably high. This is because there is no distinction between your business and personal assets when you are a sole trader. When naming your company, it’s important to remember that there could be other companies out there with the same name, which could lead to confusion when a customer is trying to search for you online. Remember to keep accurate records of your incomings and outgoings, as you will have to fill in a self assessment tax return online by 31st January every year, for the previous tax year. After submitting your tax return, HMRC will then send you a tax bill that will need to be settled with them directly. You will be liable to pay National Insurance on your taxable earnings, which you will asked to pay alongside your tax bill. Please refer to the charts below, which shows you the current Tax bands and National Insurance rates for 2018/19. There are currently 1.9 million limited companies in the UK, a number that is steadily rising. Limited companies offer the self employed the opportunity to build a unique company and identity, which is kept separate from the owner. 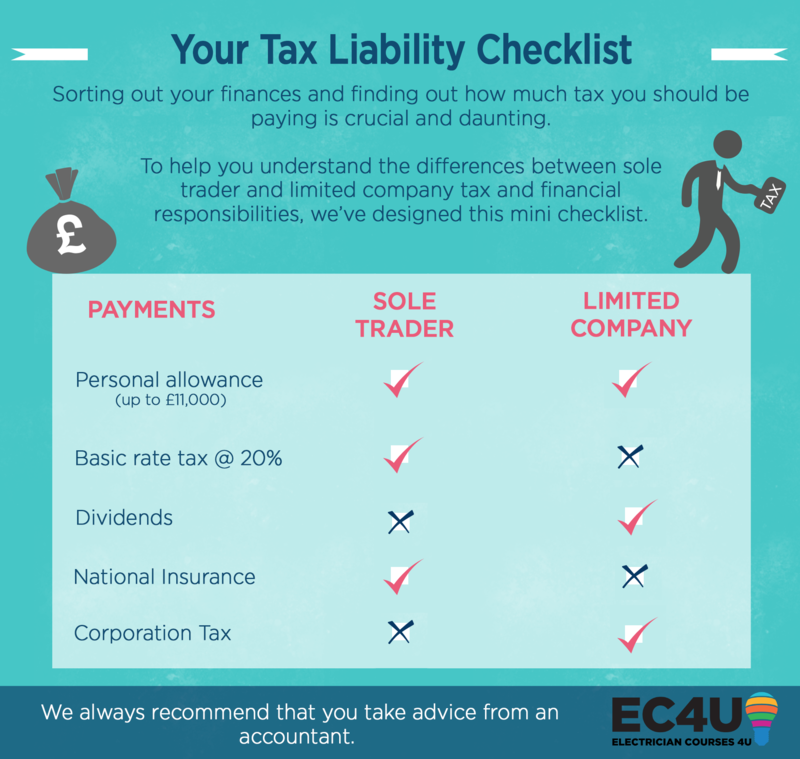 With limited companies, you will have more protection compared to a sole trader. For example, if the limited company is in debt, the debt is not on the hands of the owner, but solely on the company and you will not be liable personally. The cost to set up a limited company starts from £39.99, which can include privacy of your personal address details if required. Some companies will prefer to deal with only limited companies, as the public perceive they are safer to do business with. As a small business and limited company, the director is subject to tax under the current PAYE Government scheme. Usually, a company director will be paid slightly below the minimum tax allowance (£11,850) which attracts 0% tax. When setting up the company, you will also be named as a shareholder of the business, as with every limited company, which will top your pay up accordingly by paying yourself dividends. Dividends are an additional salary which can only be paid if your company is making a profit. 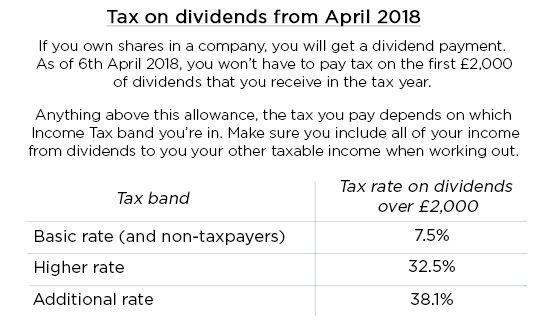 Please refer to the chart below to see how dividends work and could apply to your business. If you are named as the company director and a shareholder who has received dividends, you will also have to file a personal tax return online by 31st January, just as a sole trader would. They will then calculate how much tax you owe and send you a tax bill for you to settle. At the end of each financial year, you will have to submit audited accounts to Companies House, which is done by your accountant. Your accountant will also calculate from any profits your Corporation Tax due to HMRC. After you have chosen to become either a limited company or sole trader, you then need to take the following important items into consideration and factor in how much they will cost you additionally. No matter what your business is, you must take out insurance. The type of insurance you take out for your business depends on the type, most commonly either professional indemnity or personal liability. Research both options carefully and decide which one is best for your business. To find out which insurance plans fit your self employed business best, check out Hiscox. Look out for great deals on business bank accounts, as it’s crucial for you to keep your business and personal bank accounts separate. Banks often have deals that include a certain number of years free on business accounts, with no additional banking costs associated with it. Try using MoneySupermarket to find the best offer in the market currently. You should also research accountancy firms for your business. It’s helpful to get recommendations and also get various quotes to compare, to find the best price and service. You want to leave a great lasting impression on your customers, suppliers and business relations, and the best way to do that is with a good quality business card that represents your business well. Consider other stationary such as headed paper, especially if you are issuing estimates and quotes, and also any marketing or advertising to get your name out there. If you haven’t already, make sure your business has a professional website. It is often the first impression anyone has of your business, especially potential customers. In the digital age, everyone needs to have an online presence to tap into new markets and it also makes it easier for customers to find you. 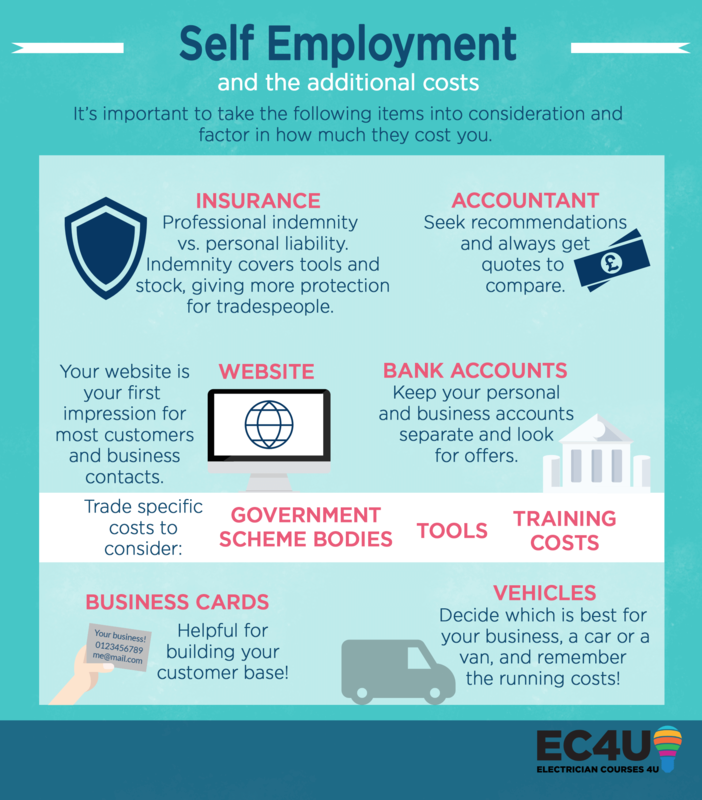 If you require a car or van for your business, consider the various costs that come with running a vehicle (price, fuel, insurance, repairs, etc). Decide which is better for your business, car or van, and also consider having your business logo displayed on a van, including your contact information. If you are joining the trade industry, three main costs you will need to consider are: government professional bodies, training requirements and tools. If you plan to join any government approved professional bodies, remember there are annual fees for each. There are various bodies for different trades. For example, for electricians, there is NICEIC for registered electricians and for plumbers and those working with gas, there is Gas Safe. Make sure you find the right scheme body to join. If you require training in your chosen field, it’s important to remember the costs that come with retraining or expanding on your qualifications and skills. If you are going self employed in the trade industry, tools for the job are essential and can also be costly. Make sure you cost out essential tools you will need on the job and then branch out for more tools later on as your business expands. Make sure you research different brands, go to tool suppliers, make sure the grip is comfortable and suit your needs. For example, if you work in small spaces, you will not want big, clunky tools to use, you will want to go for smaller, compact tools that perform well in tight spaces. Remember to consider your business options carefully, whether you opt to become a sole trader or a limited company. They both have their benefits, but one may be better suited for you than the other. A limited company could help you take home more of your earnings and also maximise on business, as it gives you a unique identity, security and better potential for growth. With either business options, it’s imperative that you make sure all of your accounts are accurate from the start. A clean start will enable you to keep better track of TAX and VAT returns when the time comes. It is easier to run your business when everything has been organised and well maintained. It is not uncommon for you to pass your accounts on for an accountant to complete, allowing you more time run your business. But above all, now that you are self employed, you have the freedom to create a work schedule that works around you and your needs. Now’s the time to embrace that entrepreneurial spirit and build your business from scratch, while making money from doing something you enjoy and are passionate about. If you enjoyed reading about becoming self employed, then take a look at our guide to getting started as an electrician!